Nat. Arr. Brit. Pl. (London) 1: 630. 1821. Cap 30-80 mm broad, at first convex, becoming convex-umbonate, maturing plano-convex, often with a low umbo; margin decurved, level in age, occasionally wavy; surface dry, finely appressed fibrillose to silky-fibrillose; color when young, yellowish-brown to olivaceous brown, margin paler, becoming dark orange to reddish brown in age; KOH dark reddish brown on surface; context thin, up to 3 mm near disc, rapidly thinning towards margin, soft, drab yellow, unchanging; odor not distinctive; taste mild, radish-like in some forms. Gills adnate to notched, sometimes with a decurrent tooth, close to subdistant; color at first yellowish with olivaceous tints, becoming pale orange brown, maturing dark orange brown; gills relatively broad, 15-20 mm in width; lamellulae in 3-4 series. Stipe 30-60 x 5-10 (12) mm in width, slender, equal to slightly enlarged at base, round to flattened, hollow in age, relatively brittle; surface pale yellow, fibrillose-striate, fibrils dull orange to brown; partial veil cortinate, yellowish, forming an ephemeral cobwebby veil high on the stipe and scattered fibrils below; yellowish tomentum at base. 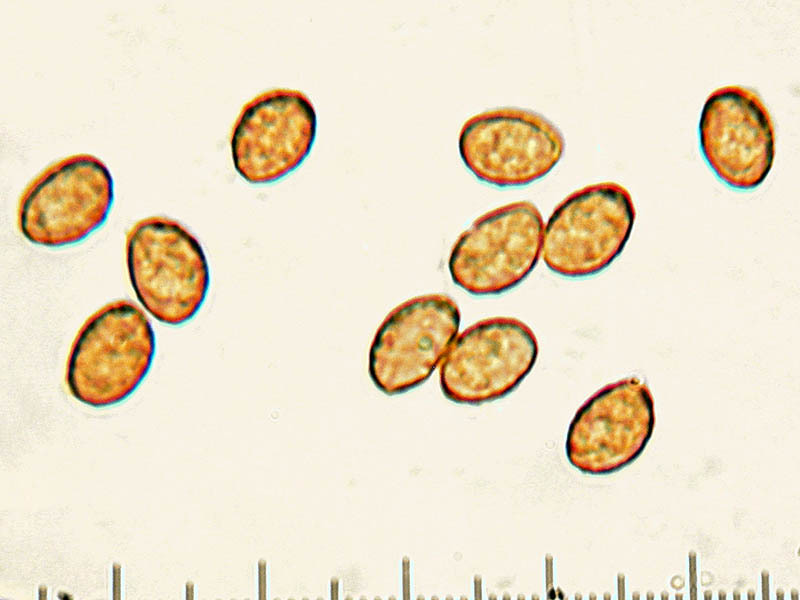 Spores 7-9 x 4-5 µm, ellipsoid in profile and face-view, slightly inequilateral in profile, finely warted at 1000X, lacking germ pore, hilar appendage inconspicuous; spores dark orange brown in deposit. Scattered to gregarious in needle duff of conifers, occasional with hardwoods; widely distributed, coastal and montane. In the San Francisco Bay area fruiting mid-winter under Monterey pine; in montane regions after fall rains; common. 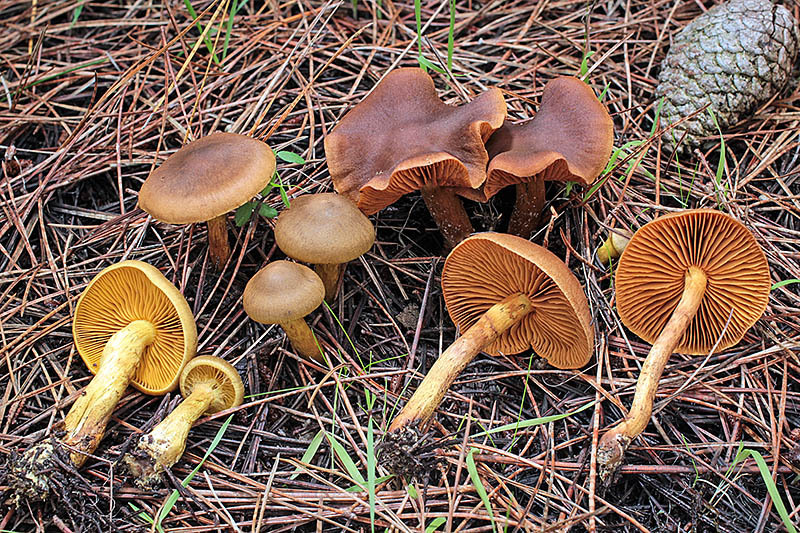 This Cortinarius belongs to a group of species with dry, fibrillose to silky fibrillose caps and brightly colored gills. Despite their beauty, they are not easily separated due to similar colors that often change with age. An example is Cortinarius croceus. The young caps are yellowish-brown to olivaceous brown but become reddish brown in age, while the gills are yellowish in youth, dark orange at maturity. For many years it has been confused with Cortinarius cinnamomeus. 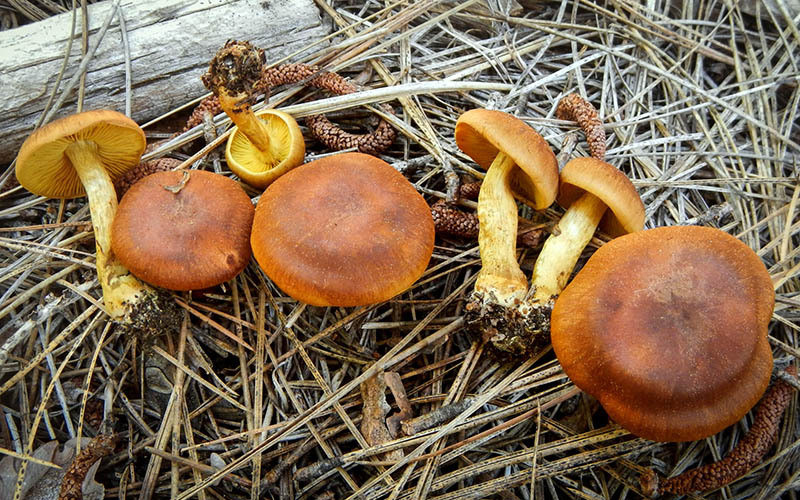 Both species have brownish caps at maturity, but C. cinnamomeus has orange gills when young, while those of C. croceus are yellowish. Other species that mimic Cortinarius croceus with olivaceous caps and yellowish to olivaceous gills when young are not so easily distinguished. They include Cortinarius humboldtensis which differs in having a dark violet reaction with KOH; Cortinarius olivaceopictus with slightly smaller (by 1 µm) spores; and Cortinarius thiersii, a montane species resembling young C. croceus, found in the spring after snowmelt. Brandrud, T.E., Lindström, H., Marklund, H., Melot, J. & Muskos, S. (1992). Cortinarius Flora Photographica, Vol. 2. Cortinarius HB: Matfors, Sweden. 60 il + 40 p.
Knudsen, H. & Vesterholt, J. ed. (2012). Funga Nordica: Agaricoid, boletoid, clavarioid, cyphelloid and gastroid genera. Vol. 2. Nordsvamp: Copenhagen, Denmark. 572 p.